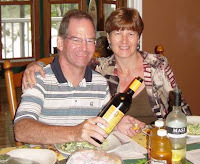 Ideas and advice for your wedding anniversary, with articles on traditional anniversary gifts by year for him and for her, 10 secrets of a happy marriage, anniversary quotes, romantic getaways and more. Many couples like to select a gift that reflects their anniversary year. This article looks at the traditional and modern anniversary gifts by year associated with each anniversary. If you are looking for something less traditional then check out Anniversary gifts for Her, Anniversary gifts for Him, or romantic getaways. You may also be interested in finding some Wedding Anniversary Quotes and Sayings to personalize Free Anniversary eCards to your husband, wife, friends or relatives. Traditional anniversary gift lists are believed to date back to medieval Germany, when a wife was given a silver wreath by her friends and neighbours to commemorate 25 years of marriage, and a gold wreath after 50 years. Over time, this tradition expanded to cover other anniversaries. 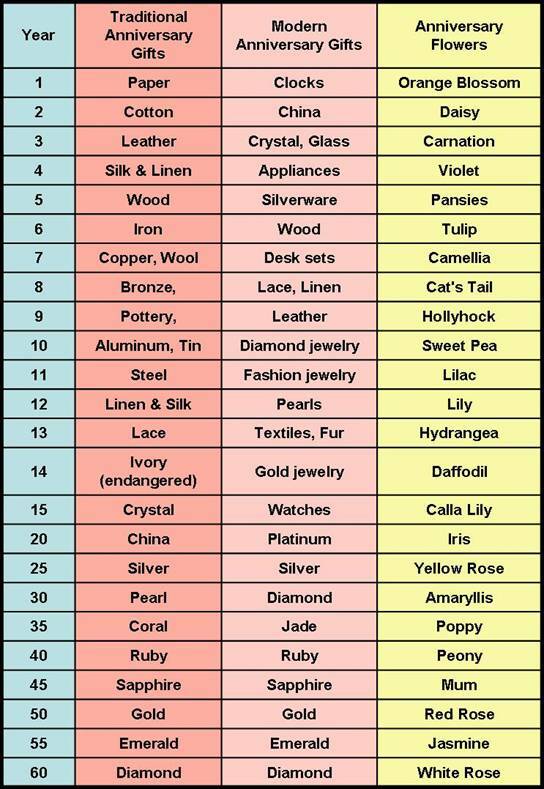 Since then other countries have adopted lists of wedding anniversary gifts by year and, although there is some variation between countries, most agree on the major anniversaries, namely: 5th Wooden, 10th Tin, 15th Crystal, 20th China, 25th Silver, 30th Pearl, 40th Ruby, 50th Golden, 60th Diamond. The traditional and modern lists for the U.S. were originally complied by the Chicago Public Librarians. Before 1937, only the 1st, 5th, 10th, 15th, 20th, 25th, 50th, and 75th anniversaries had an associated gift. However, in 1937 the Jewelers of America introduced an expanded list. There is also a list of flowers for each anniversary by year. This seems to have even more variation between country, presumably because of the regional availability of certain flower species. 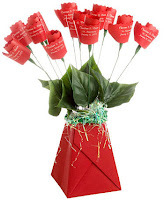 If you are struggling to think of gifts to fit each category, take a look at JustPaperRoses. They have taken the classic bunch of roses to a whole new level. Starting with "Paper Roses" for the 1st anniversary, they have developed a bunch of roses for each anniversary made out of the traditional material for that year, e.g. cotton for the 2nd anniversary, leather for the 3rd, etc. I hope you found this article interesting. You might also be interested in the Top 10 Gifts NOT to Give Your Wife on Your Anniversary! and Why Do Men Forget Anniversaries? When Is Fathers Day 2013? Ship Anniversary Gifts Overseas for Free! Hello, my name is +Geoff and I've been happily married to my wife for 30 years. We have three adult children who are all busy chasing their dreams. I started this blog to allow me to share some of the experience that I've gathered over the years. I see it as an opportunity to give back, provide an outlet for my creative ambitions and to help me understand the power of the internet.